Geocaching Australia - View topic - Channel 9 Renovation Rescue - Screen Goo make over! Channel 9 Renovation Rescue - Screen Goo make over! Did anyone happen to record tonights episode of Channel 9 Renovation Rescue where they did a Screen Goo Projector screen??? I only realised it was on at the end and missed the important bit. Below is a couple of images from a website that was talking about the episode. I actually thought it was an old show till I recognised the guy who was having his house re-done. I watched the show tonight and didn't pay much attention but she did mention she used the Screen Goo product which was much cheaper than buying a projector screen. That was about it really, it appeared to be a paint on product that somehow works even better than a screen. About 5 seconds worth. Yeah its what i'll be using for my screen. I just wanted to see what else they said and how the applied it etc. Yes but thermal backing probably isnt at the level I am looking for. Screen Goo is significantly less expensive than buying a screen, each jar of it is specifically formulated for the projector that youÃ‚â€™ll be using. Not only that, but Goo Systems asks you how much ambient light there will be in your theater, whether you're using a front-projection or rear-projection system, the size of your screen including its length and diagonal measurements, and even whether you like your projection to look more film-like, or TV-like. What you wind up with is a specially-prescribed paint that results in a painted-on screen thatÃ‚â€™s theoretically as good as its conventional counterparts. 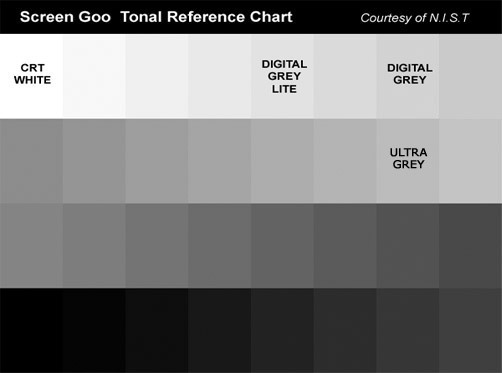 Screen goo comes in the different grey levels. A few highlights from that review. On the top of this image is the Screen Goo screen, and the bottom is a Da-lite screen with a gain of 2.2. As you can see with this image from the same projector taken at the same time, the two are quite similar. This ANSI brightness test pattern shows the difference between the Screen Goo screen (top) and the Da-lite screen (bottom). However, notice the blacks are blacker on the Goo screen. And I can get it right here in melbourne. Wasn't watching the show, but it was on and others in the household were watching it. I saw one section where they mentioned the product, only because you mentioned it in ICQ a few weeks back and I recognized the name, I saw the graphic that mentioned the Screen Goo cost $399 for 1 litre or thereabouts - that's not cheap stuff, but I guess compared to a 4 or 5 thousand dollar screen it's not bad!! Didn't see them apply it ot the wall though, my eyes had glazed over by then and I'd slipped back into a coma. HereÃ‚â€™s one caveat if youÃ‚â€™re deciding to buy this product: I noticed that the Goo Systems Web site advised us to buy more paint than we needed. In our Midwest Test Facility theater, the screen is 74 inches wide and 54.5 inches tall. Goo Systems advised us to buy 1 liter each of the topcoat and the base coat. We only used one third of each container, even when we placed two coats on the wall of our theater. Save your money Ã‚â€“ for less than $100, you can get the half-liter size of each the topcoat and the base coat. Unless youÃ‚â€™re painting an extremely large screen or making a lot of mistakes, I think the half-liter will do.